After being named as one of Britain’s New Radicals, Jane has been chosen as one of the speakers at the Liverpool event for TEDxObserver, a festival of ideas. TEDx is a programme of local self-organised events created by TED in order to make sure that people everywhere can experience ‘ideas worth spreading’ from the world’s most fascinating thinkers and doers. TEDXObserver is taking place in Sadler’s Well’s, London, this coming Saturday 10th March, but the talks will be simulcast to a number of regional events which will also feature exclusive talks of their own. 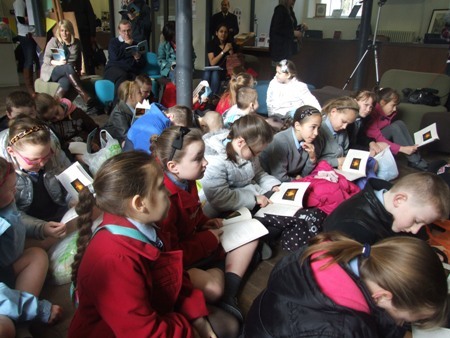 Jane will be appearing at the Bluecoat in Liverpool, delivering a talk on ‘The Social Importance of Reading’, alongside TRO patron Frank Cottrell-Boyce, astrophysicist Robert Simpson, Roy Boulter and Sol Papadopoulos of Hurricaine Films. The event will be hosted by Tim Adams, staff writer on The Observer. Tickets for Saturday cost £10, including lunch, and are available here. The Bluecoat is holding an artists’ book fair this coming Saturday, 19th November. Original and outstanding artworks purposely designed in book form in an astonishing variety of shapes and styles will be on display and available to buy. The beautiful designs are often published directly by the artists, with works from a range of makers and artists including local artist Elizabeth Willow, staff and students from Wirral Met and Cafè Royale Books, whose publications are held in collections belonging to the Tate, V&A, MoMA and the Japan Museum of 21st Century Art. If you’re looking for a unique and unusual Christmas gift idea for a literature or art lover, you couldn’t ask for anything better. For an Saturday afternoon out, you may also want to combine your visit to browse this extraordinary collection of bookish art with a visit to the exhibition of Matisse’s beautiful illustrated books currently showing at the Walker Art Gallery. The artists’ book fair is on from 11am to 5pm and is free. As part of the Liverpool Arabic Arts Festival, the Bluecoat will be hosting two exciting literature events over the coming week. The first, Anatomy of a Disappearance: Hisham Matar in conversation with Suzi Feay will take place on Wednesday 6th July from 7 pm – 8.30 pm. 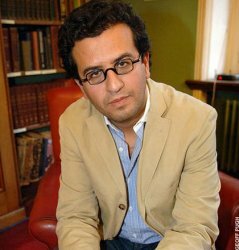 Matar, a Libyan author whose first novel, In the Country of Men, was shortlisted for the 2006 Booker Prize, will discuss his new novel, Anatomy of a Disappearance, life and writing with fiction reviewer Suzi Feay. His latest novel is based on the real-life story of his father, an opposition politician who disappeared during the Gaddaffi regime, and asks what happens to those left behind. On Saturday 9th July (3 pm – 4.30 pm), join Samuel Shimon in conversation with Eckhard Thiemannto mark this year’s new English translation of Shimon’s acclaimed autobiographical novel, An Iraqi in Paris. Assyrian Iraqi author Shimon will discuss his fascinating life and work with LAAF Guest Curator, Eckhard Thiemann. Tickets for both events cost £3/£2 for concessions, and can be booked at www.thebluecoat.org.uk or on 0151 702 5324. The 2011 winner of one of Britain’s most prestigious literary awards, the Orange Prize for Fiction, will be announced on Wednesday 8th June at a glittering ceremony in London. On the same night, a special Liverpool Readers’ Night centred on the prize takes place at The Bluecoat. The city’s literary lovers can join Liverpool Libraries’ staff and members of local book groups for an evening dedicated to celebrating the cream of female authors. Extracts of the short-listed books – which is comprised of Room by Emma Donaghue, The Memory of Love by Aminatta Forna, Grace Williams Says It Loud by Emma Henderson, Great House by Nicole Krauss, The Tiger’s Wife by Tèa Obreht and Annabel by Kathleen Winter– will be read, there will be a light-hearted literary quiz to partake in (so time to get swotting) and free prize draws to enter. Attendees will also be able to cast their vote for who they believe should be Liverpool’s winner from the selected shortlist. The Orange Prize for Fiction is in its 16th year, with previous winners including Reading for Wellbeing guest speaker Marilynne Robinson, Liverpool Reads’ (precursor to Our Read) approved Andrea Levy and Liverpool-born Linda Grant. Tickets for the Liverpool Readers’ Night cost £3/2 and can be booked from The Bluecoat box office on 0151 702 5324 or through the Bluecoat’s website. 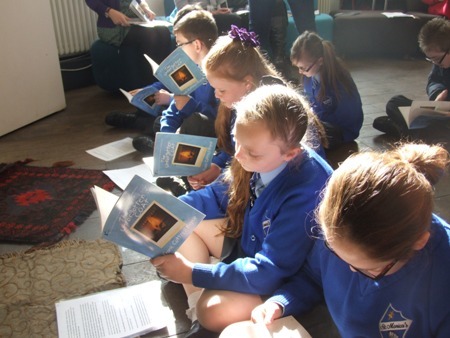 They are also available from Peter Wallace, Reader Development Officer, Liverpool Libraries who can be reached via e-mail: Peter.Wallace@liverpool.gov.uk . 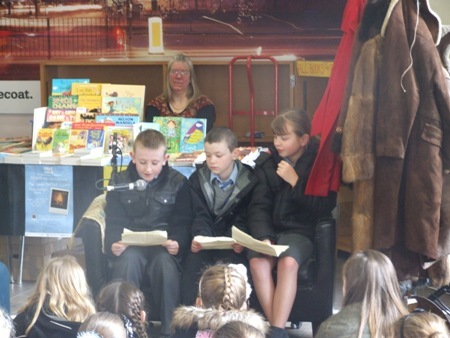 Thanks to everyone who came down to support us on the day – especially to those who read aloud – we all had a brilliant time! 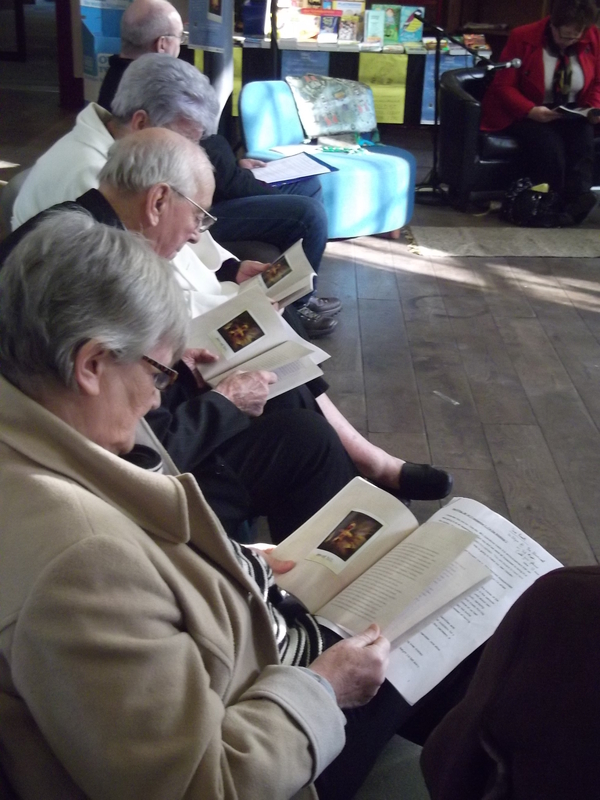 Today, TRO staff and volunteers , plus some reading group members, are taking part in ‘Bed in at the Bluecoat’. Marking the anniversaries of Lennon’s birthday and assassination, the Bluecoat is recreating John and Yoko’s famous 1969 peace protest. Each day a bed in their Hub will host a new action by performers, artists and others. It’s our turn today and we’ll be ‘Reading in Bed’ between 11am – 3pm, for 15 minutes each. Come on down and listen to us reading a selection of poetry and short stories, some of which will be from Angela Macmillan’s wonderful collection, A Little, Aloud. FOR ALL LOVERS OF LITERATURE – the 3rd annual Chapter & Verse Literature festival at the Bluecoat starts today Wednesday 13 October and continues til Sunday 17 October with a wonderful programme of readings, talks, films, performances, workshops and much more. The full programme is available on our website www.thebluecoat.org.uk and our ticket line is 0151 702 5324. Don’t miss this chance to be enlightened, engaged and enchanted. If you wish to attend, you can go to www.liv.ac.uk/businessgateway/events/ to register (although it is fine to just turn up on the day) and get a full programme of the afternoon. Last few days to see images by Dave McKean from The Savage at the Bluecoat (School Lane, Liverpool, L1 3BX) until 1st November 2009. This exhibition features a selection of original artwork from this year’s Liverpool Reads book The Savage including the original front cover from the hard back edition which is both intriguing and chilling. Dave McKean has illustrated several award-winning comics including Arkham Asylum with author/playwright Grant Morrison, Signal to Noise and Mr. Punch with author Neil Gaiman. He has written as well as illustrated two books (Cages and Pictures That Tick) released four different collections of his photography (Black and White Lies, Option:Click, The Particle Tarot: The Major Arcana and The Particle Tarot: The Minor Arcana) and has created hundreds of comic and book covers including the hugely popular Sandman series. Multi-talented, Dave has created ad campaigns and over 150 CD packages for Michael Nyman, Tori Amos, Counting Crows and Alice Cooper amongst others. He has worked on a variety of book and film projects with John Cale, The Rolling Stones, Milcho Manchevski, Stephen King, Lars Von Trier and Iain Sinclair. He is currently directing and designing films including the recent Jim Henson Studios produced Mirrormask and character design on the Harry Potter movie franchise. He also jointly oversees the running of the jazz record label Feral. The Bluecoat is delighted to host an exhibition featuring a selection of original artwork by Dave McKean from The Savage. The exhibition starts outside the bar (press 2 in the lift) and continues on the floor above. It is open from 10.00am until 10.00pm Tuesday to Saturday and 10.00am until 6.00pm on Sundays and Mondays. The images displayed are courtesy of the artist Dave McKean with support from Walker Books and David Almond.